Devoted to your personal injury or accident case. 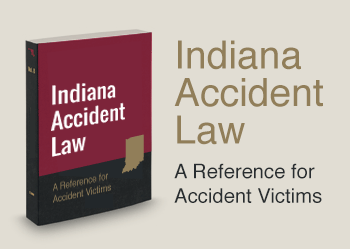 For injury victims throughout Indiana and the Midwest. On the highest of ethical, moral, and legal standards. Founded in 1899, Parr Richey Frandsen Patterson Kruse LLP has been committed since the beginning to providing high-quality legal services based on our long-standing foundation of high standards of professionalism, ethics, client service, and compassion. We don't simply meet our clients' needs. Instead, our Indianapolis personal injury attorneys strive to identify our clients' needs and then work as hard as possible to surpass expectations! We have successfully obtained millions of dollars on behalf of our clients throughout Indiana. Let us help you by calling for your FREE consultation at (888) 532-7766! Attorney McLaughlin was listed in Rising Stars Super Lawyers®, 2013 - 2017, and The National Trial Lawyers: Top 100 Trial Lawyers for the State of Indiana. We have successfully handled many cases in all levels of state and local government. 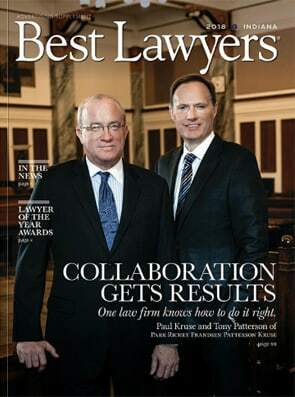 We have a reputation as one of the preeminent and oldest law firms in Indiana and we can put our extensive knowledge and experience to work for your personal injury claims. We are a team of tenacious trial attorneys who believe in exhausting every avenue of legal options to secure the best possible result for our clients. We strive to provide comprehensive legal representation to individuals who need it the most! When you have suffered due to the negligence of someone else, we are here to help you obtain the compensation you need to recover. Doing so has helped us obtain million-dollar settlements for our past clients! Trust us to investigate the value of your case! We can help you determine whether you have grounds for a claim. When you work with our firm, you not only work with our experienced trial lawyers, but you will also have a team of expert contacts and resources on your side. We thoroughly investigate your claims with innovative research methods and professional opinions to maximize your compensation so that you can get back on track. We strategize on a case-by-case basis, and we always bring our courtroom experience to the table. We are completely dedicated to helping you move on with your life after an accident. If that means going to trial, we won't be afraid to take your matters to the court. Were you injured in Indianapolis? Call for your free consultation! We use our extensive experience and vast wealth of knowledge to each client's advantage. If you have been involved in a personal injury accident in Indianapolis or Lebanon, contact Parr Richey Frandsen Patterson Kruse LLP today! Whether we are providing counsel to your complex litigation or representing a simple legal matter, we can be trusted to help you obtain the best possible result with minimal liability. Call us today to schedule your free case evaluation. Our phone lines are open 24 hours a day, 7 days a week. Our personal injury law group is a part of a larger firm at Parr Richey Frandsen Patterson Kruse LLP.